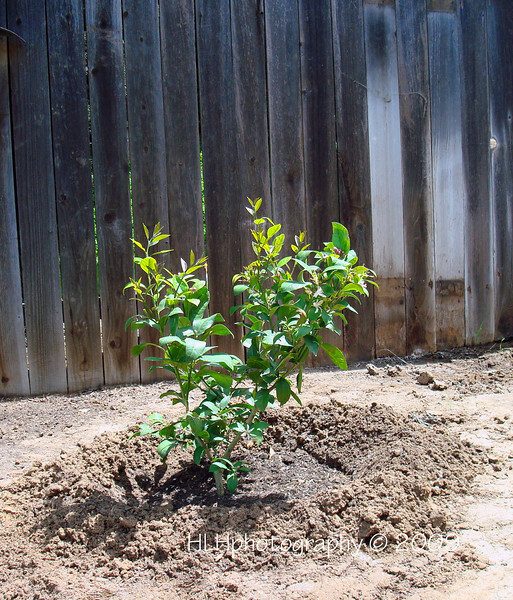 4.16.2009 Planted this Dwarf Meyer Lemon tree next to the new shed and the fence you see in the background. I hope it will get enough sun as there are a couple of large, tall Cypress trees that block the sun till about 11:30 A.M. just to the left on the other side of the fence in our neighbor's yard. The shed blocks the sun from about 3-5P.M. and then the sun hits it again for about an hour. Should get longer as the Summer nears. It needs 4-5 hours a day they tell me.